When you go through things that you don’t understand, it is not the end. Nothing is lost in the kingdom. God is going to appoint another seed, and that seed represents the future. It indicates what is coming. If you will let go of what didn’t work out, let go of the hurts and pains, then for everything you’ve lost, God will appoint another seed. You’ll give birth to more in the future than you lost in the past. When you see someone who is struggling, a co-worker who is discouraged, a friend who is not up to par, how do you respond? Our words can be what keeps a person going; our compliments can put a spring back into their step. Now more than ever, we need to automatically let the encouragement flow. We need to tell others how much we love them, how we value them, and tell them that they are talented and creative. Always remember, with your words you carry life-giving water. You carry hope, healing, encouragement and new beginnings, and you can pour it out everywhere you go. Today, choose to speak encouragement. Choose to speak victory and faith. Instead of telling people what they’re doing wrong, instead of pointing out all their faults, find what they are doing right. Only insecure people do that. Focus on the good. There are already enough critical, judgmental people in the world. 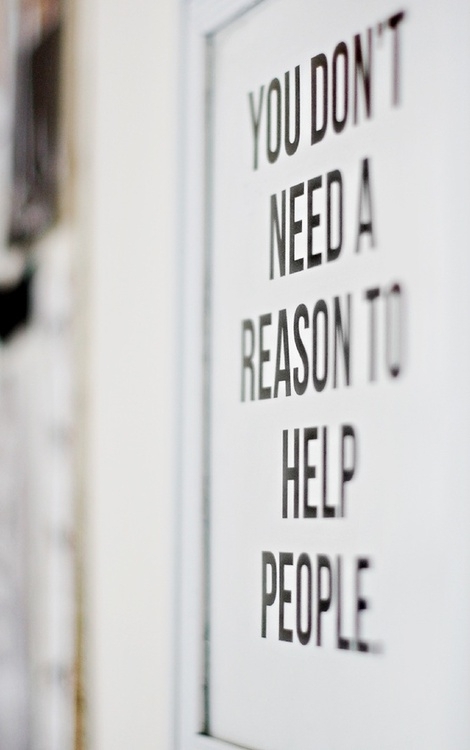 Let’s be people who lift up others and restore them. Let’s be the light of Jesus in the world. I’ve learned that when the enemy attacks, God reacts. God doesn’t just sit back and think, “Well, I wonder what’s going to happen. I wonder what they’re going to do.” No, God goes to work. You are His most prized possession. It says in Psalms, “God is close to those that are hurting. God is close to the broken hearted.” God knows when you’ve gotten a bad medical report. He knows when you’re struggling in your finances. He knows when you’re being mistreated. You may not see anything happening, but you can be assured that Almighty God is not only aware, He is at work. He already has the solution. If you will stay in faith, at the right time, He will release a flood of His power, a flood of healing, a flood of restoration. He will not only bring you out, He will bring you out better off than you were before! Amid the controversy of this film from both mainstream and Christian media outlets, the only question that matters is this: Is the film any good? Yes, the answer is yes. Darren Aronofsky’s revisionary take on the Genesis tale is quite an engaging film when you look past the controversy and uproar of how the film deviates from the source material. If you do, then you can actually enjoy the message that Aronofsky and Company are sending. 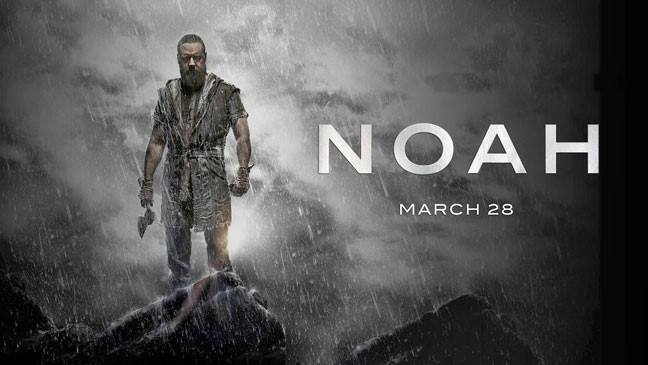 This film highlights Noah as an obedient servant of his Creator that is willing to do all that is asked of him. It also showcases how this task can change the man that Noah had become, and the downward spiral that his mind takes. Something which is very troubling to his family. Noah is a tale of morality and justice between doing what is “necessary” and what is right. Everyone in this film follows a similar path: from being obedient for their father/superior, to questioning this same being. A journey of self-discovery and thinking for oneself leads to the confrontations of the last half of the film. Noah deals with the mental and psychological consequences of being tasked with doing whatever is necessary to ensure the survival of all of the “innocent creatures” during the annihilation of man. 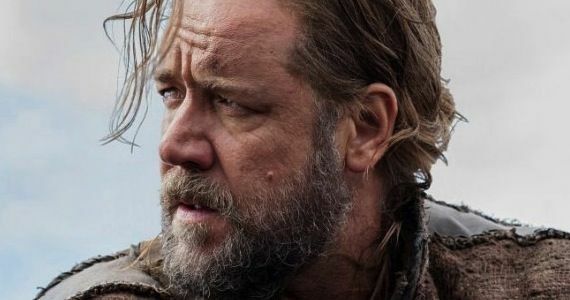 The film stars Russell Crowe as Noah, and the casting could not have been more perfect. Crowe’s demanding presence makes you focus on him intently as he helps you see the tremendous weight that is put on his shoulders. His glare begins solemnly enough and slowly deteriorates into an obsessive and grim look as the movie progresses. You watch as every move he makes is not necessarily the one he wants to make. His wife is played by Jennifer Connelly, who also starred in Aronofsky’s Requiem for a Dream, and she represents the down-to-earth loving wife/mother who is struggling to keep her husband from the brink of madness. While she represents the moral backbone, Emma Watson and Logan Lerman’s characters (adoptive daughter and son, respectively) are the heart of the film, each fighting their own demons as the end of mankind looms. Rounding out the main cast are Anthony Hopkins and Ray Winstone. Hopkins plays the old and wise grandfather of Noah, who gives encouragement and guidance to all who visit him or found by him. Winstone plays a descendant of Cain and is the representation of the cause for the extinction of man. His villain may have been slightly generic, but Winstone delivers a great and empowering performance as a man who is desperately seeking the knowledge of why his Creator has forsaken his people. The look of the film is quite astonishing. The backdrop, locations, and set designs are beautifully done and give the film a certain unique tone. Aronofsky’s signature montage-type shots also made it into the movie, especially shining during the creation/evolution scene. 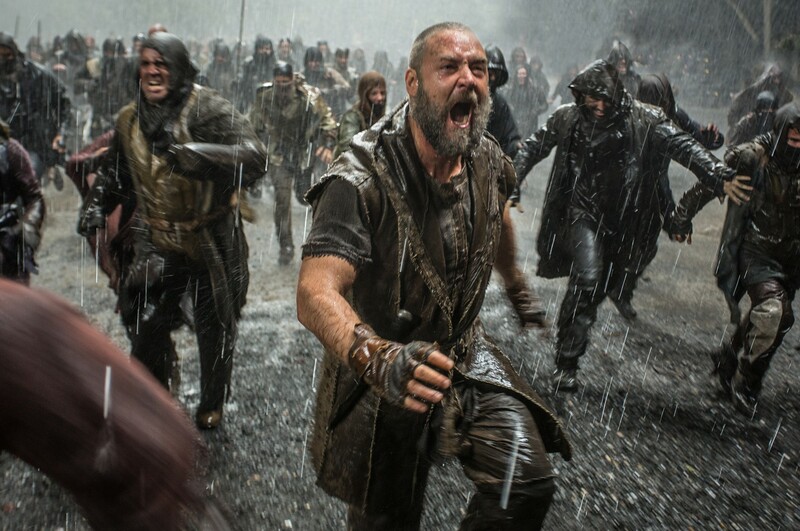 The most interesting use of effects in the film was not the giant floods of water or battle scenes, it was the Watchers (fallen angels) who helped Noah through his journey. I’m not sure how they were brought to life on the screen, but the stop-animation-like appearance the Watchers had was a bold choice to insert into a 21st century film. But by any means, I absolutely loved them and the overall look of the movie. This biblical epic is an outstanding movie that is shrouded in unnecessary controversy. However, I believe that Noah triumphs over this backlash and can be enjoyed by all faiths and persons. Aronofsky delivers a beautiful look into one of the most harrowing and challenging journeys that one man can be tasked with. I definitely recommend it and I pray you enjoy it as I did. Scripture tells us clearly that God’s plans are for our good! 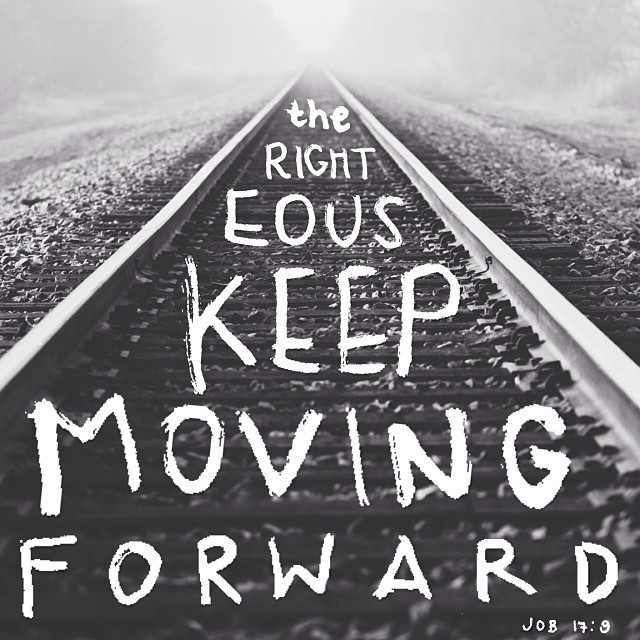 He is leading us in paths of righteousness for His name sake. He is our Deliverer, and He will lead us in the direction we should go. The prayer comes full circle and ends again in worship. In summary, we see that prayer includes: worship, surrender, asking for provision, forgiveness, asking for direction and worship. 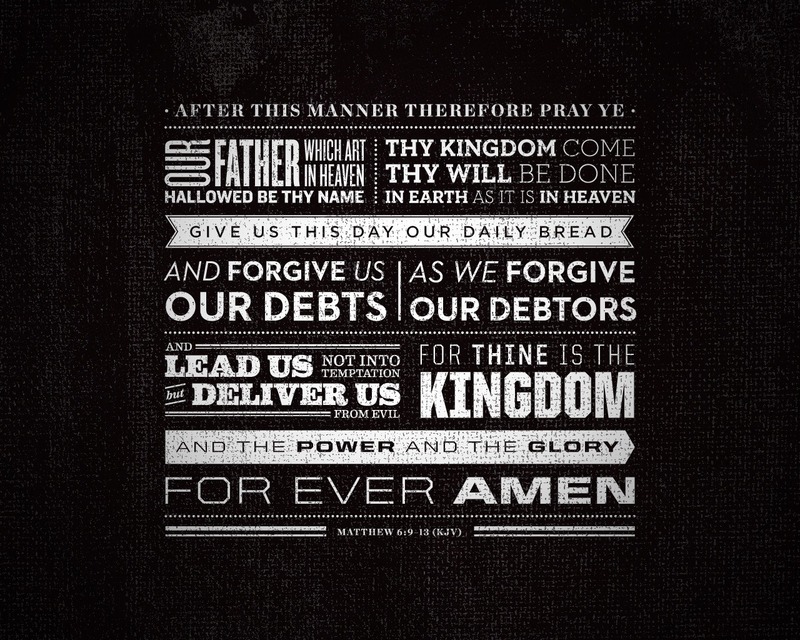 When we pray like this, it gets God’s attention. When we pray according to His will, we know it will be done! When we ask in faith, we receive what we have asked because He who promised is faithful! Why don’t you make prayer your priority? Let it be as natural as the air you breathe. Follow Jesus’ example and walk in His blessing and victory all the days of your life! You keep track of all my sorrows. You have collected all my tears in your bottle. You have recorded each one in your book. Psalm 56:8, NLT. Do you know how important you are to God? He cares so much about every detail of your life. He cares about your thoughts, feelings and emotions. In fact, what you are going through is so important to Him that He records every sorrow and collects the tears you’ve shed. 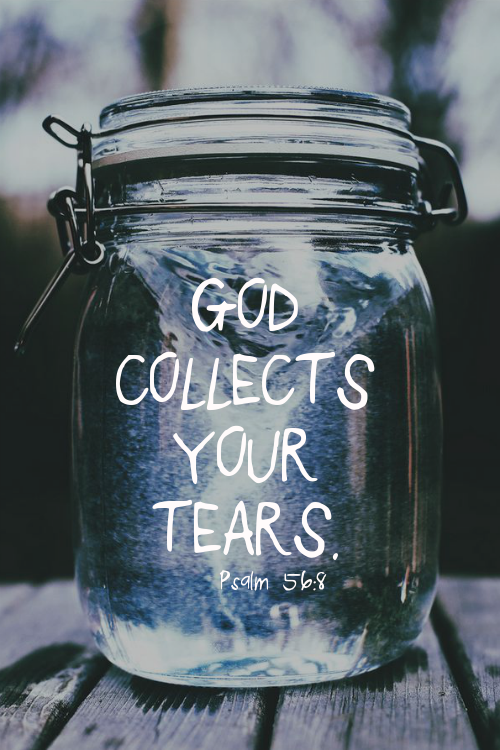 Why would God record your sorrows and collect your tears? Because everything that affects you matters to Him. He is your Vindicator. He’s keeping an account of every wrong that’s ever been done to you so that He can make up for every single one of them. He wants to restore to you everything that has ever been stolen. He wants to heal every hurt and pain. A mustard seed is a very small thing. But when it’s planted, it grows into a huge tree. In the same way, Jesus is saying that a little bit of faith can bring tremendous results! As a believer in Him, you already have enough faith on the inside of you to overcome any obstacle. The same Spirit that raised Christ from the dead actually dwells in you! It doesn’t matter if you grew up in church or not; it doesn’t matter what you know or don’t know; God wants to work in your life today. And you may not see how, but all you have to do is believe God. With God, all things are possible. 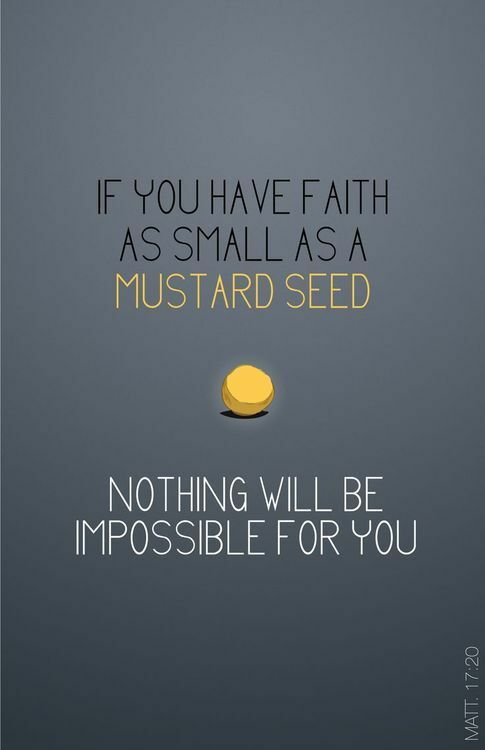 Do you have mustard seed faith today? The Bible says that faith without works is dead. When you have faith, your words and actions reflect it. Take a step of faith today and declare your trust in Him. 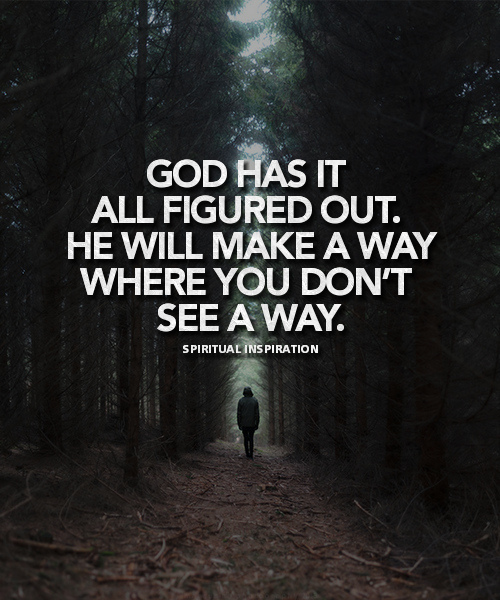 Even if you don’t see how, declare that God is working behind the scenes in your life. As you act on your mustard seed faith, you’ll see it grow stronger and stronger, and you will live in victory all the days of your life! We all go through challenges, disappointments and unfair situations. It’s easy to get overwhelmed and think, “This is too much. I can’t deal with this illness. I can’t handle this difficult child.” Or, “I can’t take this traffic. It’s driving me crazy.” But, God promised He will never let us face more than we can bear. Nothing that comes your way in life is too much for you. This is what Joseph did. He was betrayed by his brothers, thrown into a pit and spent years in prison for something he didn’t do. But, he didn’t get depressed. He didn’t start complaining. His attitude was, “With God, I can handle it. God is still on the throne. I’m going to stay in faith and keep being my best.” In the end, he was made second in charge over all of Egypt. Today, if you are feeling burdened and overwhelmed by circumstances, know that with God, all things are possible. No person can keep you from your destiny, no bad break, no disappointment, no sickness. Keep believing, keep hoping, keep praying and keep moving forward because you can handle whatever comes your way!